I love to trav­el. My favorite kind of trip is a road trip, where I pack the car up with some stuff and a friend and hit the wide open road for some fresh air and free­dom. I’ve tak­en three road trips so far: one for a month along the US East Coast, one for a week long Spring Break trip to Myr­tle Beach in col­lege, and the most recent was a quick trip around the south­ern coast of Aus­tralia while on vaca­tion there. All of these trips, while incred­i­bly dif­fer­ent, all had one thing in com­mon: a plan. When I plan a trip, I don’t just hop in my car and start dri­ving some­where. First, I need an end des­ti­na­tion. What looks like an inter­est­ing place? Who could I vis­it there? Why do I want to go there? I went to Myr­tle Beach for Spring Break to vis­it a friend from col­lege (and made a slight detour to vis­it oth­er friends and fam­i­ly in Nashville and Indi­ana along the way!). I then need to know how to get there. Do it the old fash­ioned way with a map and a high­lighter, or use Google Maps. While I’m look­ing for the best route, I do some research along the route to find any inter­est­ing spots to vis­it. That’s how I end­ed up at the MLB Hall of Fame while dri­ving from Ohio to Con­necti­cut. You also need to be flex­i­ble. For instance, when we saw a beau­ti­ful reser­voir next to the road, we didn’t hes­i­tate to stop and soak up the pret­ti­ness. Plan­ning an ear­ly retire­ment is a sim­i­lar process to a road trip. No, real­ly, it is. Stop and think about the sim­i­lar­i­ties for a sec­ond. ER needs an end des­ti­na­tion (amount of mula you think you’ll need, usu­al­ly 25x your desired spend­ing rate). You need to fig­ure out how you’re going to get to ER (how much per year do I save, what account is it in, what kind of invest­ments do I want to own, etc). And then, you’ll also need to think about what you’re going to do on the way there. Am I going to rent? Buy a house? Become a land­lord? Get mar­ried and start a fam­i­ly? Job hop until retire­ment time or stay in the same place? I once read a quote on the dif­fer­ence between strat­e­gy and tac­tics. Strat­e­gy is plan­ning out things ahead of time, and tac­tics is what you’re doing in the trench­es with things aren’t going to plan. I’ve got a strat­e­gy for the next 10 years, but I know I’ll have to do some tac­ti­cal think­ing to adjust it (prob­a­bly a lot of think­ing, to be hon­est). Keep in mind, this is a very rough “back of the nap­kin” plan. This is my best GUESS as to what my next ten years are going to look like. I first put this down on paper just a few months ago, and it’s already changed. And you know what? 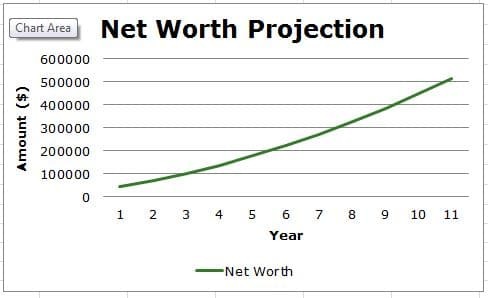 I’d be will­ing to bet my entire net worth that it will change again. That’s per­fect­ly fine! I used the lim­it­ed data I have from the last 18 months to try to project what will hap­pen in the future. I pro­ject­ed the first year and came pret­ty close, so I’m fair­ly con­fi­dent in my skills, assum­ing noth­ing major hap­pens like the Yel­low­stone Super­vol­cano explod­ing or WWIII break­ing out between Yugoslavia and Belize. rent­ed Com­ments: I made a mis­take when cal­cu­lat­ing how much went into my 401k. I includ­ed the com­pa­ny match. So, while I end­ed up with almost $18k saved like I thought I would, I actu­al­ly only saved $13k. I’ve adjust­ed now so this year will be the max plus the match. I did max out my Roth IRA, and also rent­ed a house. rent­ed Com­ments: Last year I saved $35k, so I fig­ured it was rea­son­able to assume I’d save more this year with a high­er salary and less expens­es. I signed a lease for the next 18 months, so I’ll be rent­ing until Dec 2016.
rent Com­ments: My 401k will be ful­ly vest­ed! I’ll also be fin­ish­ing up with my entry lev­el pro­gram, so I should be get­ting a nice raise. If I don’t, I won’t hes­i­tate to find a new com­pa­ny that will pay me more (and hope­ful­ly gives me more vaca­tion). rent/buy Com­ments: I have aspi­ra­tions to work over­seas for a cou­ple of years while I’m still young and can do such a thing. If I go over­seas, I’ll con­tin­ue to rent. If not, I’d love to buy a house (and am strong­ly con­sid­er­ing buy­ing a mul­ti-fam­i­ly prop­er­ty). rent/buy Com­ments: Assum­ing I stay with my cur­rent com­pa­ny, my pen­sion will vest this year. I also antic­i­pate mak­ing sig­nif­i­cant­ly more mon­ey, so I’ll put the extra mon­ey in my tax­able account. Not as good as the oth­er accounts, but bet­ter than let­ting it sit in some sav­ings account some­where. buy* Com­ments: *I’d real­ly like to be into my own house at this point after com­ing back to the US. I don’t see much of a need for the flex­i­bil­i­ty of rent­ing at this point. Also, keep in mind this assumes I’m still sin­gle. I think hav­ing a part­ner would be great, but I’m will­ing to wait for the right guy. buy* Com­ments: It’s real­ly help­ful to be born in a year that ends in ‘0’. Makes my age super easy to cal­cu­late. buy* Com­ments: This year I’ll hit $300k net worth! Just got­ta keep on truck­ing at this point. buy* Com­ments: Sav­ings are real­ly start­ing to take off here! buy* Com­ments: Wow! Almost there! At this point, I imag­ine I’ll be throw­ing every­thing I can at it to get to the mag­ic num­ber. buy* Com­ments: I’m very nar­row­ly there. How­ev­er, I’ll need to work part of the next year to be able to get the year end bonus, so I will work until August of 2025 and retire then by the age of 35! So there you have it. My plan to accu­mu­late $587,500 by the time I’m 35. Did you include your income increas­ing sig­nif­i­cant­ly in this pro­jec­tion? As a young woman also in IT (I think you’re in IT too?) I can say that it is a good mar­ket out there now for jobs. I recent­ly went to the Grace Hop­per Cel­e­bra­tion and they were recruit­ing hard­core. I also have been suc­cess­ful with nego­ti­at­ing my salary a few times (I’m 26 and have quadru­pled my salary since I was 22). You picked the right field! The plan looks real­ly nice. As you said, the strat­e­gy is defined. I guess the next years now comes down to tac­tics to reach all the inter­im goals. Love it! Can I ask how you pro­ject­ed your future net worth val­ues? I have a spread­sheet full of for­mu­las that helped me come up with it! Hey! Where do you cur­rent­ly live? I love the out­line of your plan and inclu­sion of comments–great idea. We used a few com­pound­ing inter­est cal­cu­la­tors, but we didn’t make our plan as action­able as yours. We have some work to do! You can do it! This is why I love the FI com­mu­ni­ty! Every­one has some­thing to offer that makes you stop, think, and go “hmm I should total­ly do that too!” Good luck! Hi I just stum­ble upon your blog and seem like you have a great detailed plan. I like your pro­jec­tion at least you have a tar­get and goals that you have set your sight on. I like your year 2017 plan, I real­ly think you should try over­sea work. I can relate since I’m cur­rent­ly work­ing over­sea too. You do get a tax ben­e­fit for work­ing over­sea almost $100,000 tax free but their is cer­tain rules that you have to fol­low to get that ben­e­fit. You can check out the for­eign earn income exclu­sion on the IRS web­site. Good luck on your jour­ney. Hi Jay! Thanks for com­ment­ing. I would love to work and live over­seas for a few years. Get­ting paid my US tech salary whilst pay­ing over­seas prices would be the best!